It is an honour for me to be here and to address this august assembly on behalf of our Pacific ACP member states on this auspicious occasion. I wish to focus my intervention on two key and strategic issues which are central to our future as the ACP family and how we can address within our respective contexts individually and regionally, the implementation of Agenda 2030 and the Sustainable development goals. Centrally and of paramount importance to us all is the issue of Climate Change. The Paris Agreement heralds in a new beginning. It demonstrates what is possible at the global level if countries are prepared to set aside their differences and vested interests for the common good of humanity. It also reaffirms the critical importance and support of genuine and durable partnerships based on common interests. The Paris Accord is the thread that binds the global community together. It calls for immediate and urgent action NOW, rather than more target setting and making pledges. We in the Pacific have been proactive in contributing to the solution with the acceptance of the fact that we are responsible for our own development. Let me exemplify some of these good practices. Palau for instance has created the world’s six largest ocean sanctuaries – with no fishing, and other extractive purposes. All of our countries in particular the Pacific Small Islands Developing States have shown commitment through the signing and ratification of the Paris agreement as they did on May 22nd in New York. Many have also put in place programs for the implementation of their respective ambitious Intended Nationally Determined Commitments. Climate change is an existential threat for all of our member countries that are low lying atolls. Population displacement – is fast becoming a reality and more importantly we must ensure that every avenue is explored to guarantee migration with dignity, should the need eventuate. The world must realize and accept that saving small countries like Tuvalu and Kiribati from the adverse impact of climate change, is in effect saving our planet. The Sustainable Development Goals is our roadmap for the future. The ACP Group must learn from each other – share best practices and lessons learnt and wherever possible execute these responsibilities through south-south and triangular cooperation. As a family, we need to strengthen our resilience not only to climate change but other exogenous shocks whether they be natural disaster induced or economic and social in nature. The land is what defines us. It is integral and a part of who we are. Land rights, particularly in the context of developing countries, are inextricably linked with the right to food, the right to work and a host of other human rights. In many instances, the right to land is bound up with a community’s identity, its livelihood, its very sur¬vival and a vital component of our particular way of life. The sea surrounds us here in the Pacific. While there is plentiful to sustain our livelihoods we must guard against damaging our natural environment in the haste to develop and in the name of development. We must be sure that we manage our natural resources efficiently for our future generations. Policies framed around our uniqueness and diversity must prevail. What sets us apart is our unity and solidarity. Our collective strengths will ensure that we as the ACP group is an effective partner with the EU and other development partners. It is what allows us to pursue our individual dreams and yet can come together and coalesce as one family – the ACP family. Climate funding is strategic to our efforts to fight the adverse impact of climate change. There are still numerous hurdles to accessing climate financing. I am happy to announce that Samoa is bringing home the December meeting of the Green Climate Fund Board so that they can experience first-hand what the impacts are on small islands developing states. Our global commitments must also be seen against our national obligations to education, health and other pressing needs which we accept are our responsibility. However the attempt to shift the funding burden to developing countries must not be allowed to go unchallenged. Small Islands Developing States (SIDS), LDCS and landlocked countries need our special attention. 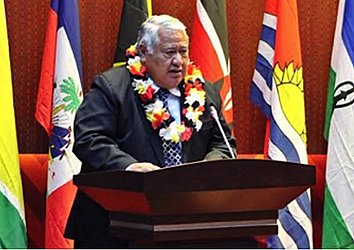 For SIDS, the SAMOA Pathway provides the foundation for future actions and partnerships. I applaud the decision of the ACP Council of Ministers to establish a SIDS Forum within our ACP structure. This is a clear demonstration of our unity and solidarity to address the challenges of all members of our ACP family. All of us are also members of various international organisations and financial institutions. We must leverage our numbers and resource endowment to secure positions that are of collective benefit to our Group. With the EU, climate change and sustainable energy comes to mind. Excellencies, my second point concerns our future, post-Cotonou. This is a defining Summit for the ACP Group and our international partners, and we need to make informed and far-reaching decisions. I am aware that the Eminent Persons Group under the able leadership of Chief Obasanjo will formally table its report during this Summit and that Council has considered and endorsed the Ambassadorial Working Group’s Report of the Future Perspectives of our Group. Clearly, the merging of the salient and practical recommendations of both reports on key strategic issues such as “foundation pillars” to guide our work post 2020 is, in our estimation, the way to proceed. But I caution against us taking decisions that we are not yet in a position to make regarding our future. There is too much at stake and too important a matter to be glossed over. Our Council of Ministers could be tasked with examining the modalities and practical structure of our organization for our final approval in due course. We in the ACP must construct a future that will strengthen our global influence in key strategic areas utilizing our strength in numbers. To this end, it is possible to envisage a post-2020 ACP Group as a “cohesive force capable of articulating its shared concerns and interests in a participatory and inclusive manner at the global level. A Group with strong and effective institutions geared towards speedy and timely decision-making and implementation. A Group focusing on and embracing its constituents and development partners, capable of demonstrating its value-added and utility. A Group that will forge new links and strengthen existing ones”. One thing is certain – we shall face many challenges that will test our resolve and resilience as a Group in the coming years. Some will be familiar; others will be new and untested. But the common denominator is the imperative for us to meet them together and front-on with clarity of purpose and vision, unwavering commitment, renewed hope as was evident in Sipopo, and above all in unity and solidarity. There is no other choice but to succeed – it is a moral imperative and our duty to the people we are honoured to represent and to serve. We are a Group steeped in traditions that cherish our diversity, seek to uphold the rule of law and the principles of democracy and good governance, believe in the equality of opportunities for all our communities and above all in seeing poverty become a thing of the past and the attainment of sustainable development. We must never forget the hopes of our peoples, whether in the land continent of Africa, or the ocean continents of the Caribbean and the Pacific. For we all share a strong and common commitment to remove injustice and poverty. What the ACP Group, is and will be, depends on us Leaders here at this Summit. We must look to the future with renewed hope and belief. We are one family. Let us consider the best options to reposition our Group to meet the future challenges that await us as well as effectively respond to the development needs of the ACP. Excellencies, My final words are to the European Union. You have stood by the ACP for over four decades and together we have witnessed strong improvements in the development of our respective countries. But together we can do more and better. Lessons from the past will help us in this regard, in particular those associated with EPA negotiations and political dialogue under Article 96 of the Cotonou Agreement. As we look forward and beyond 2020, my sincere expectation is for us to engage more in genuine political dialogue that will fast track our collective decision making process and thereby arrive at an ACP-EU partnership that will endure for the next 40 years. A partnership that we can all be proud of, that encapsulates the aspirations and hopes of our peoples, and ultimately will launch the next generations of our communities into a more prosperous and peaceful future for our ACP Group and for the world. Let me conclude my brief remarks by thanking our host, Prime Minister Peter O’Neill for coming to the aid of the ACP Group by offering to host this Summit. This gesture clearly demonstrate PNG’s solid commitment to our ACP family and the Pacific members. Thank you Mr Prime Minister and the people of Papua New Guinea for your generous hospitality, largesse and warm welcome and we look forward to a lively and well informed debate on our future beyond 2020. God bless us. Soifua.